Single: ( 1180) per person for your OWN double room. 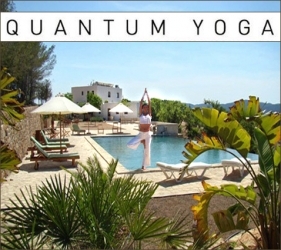 Quantum Yoga's Summer 2009 9 day retreat will take place at Shunya in the quiet north of the beautiful island of Ibiza. The beautiful white washed villa is located in a secluded spot of beautiful countryside orchards in the hills near Benirras beach, northern Ibiza. All rooms have their own bathroom. Prices include yoga tuition, accommodation, use of facilities, and tea/coffee, morning fruits and a daily big brunch. Other key amenities include a swimming pool, an indoor yoga studio and outdoor space for the yoga classes, a large covered patio, gardens and forest for quiet strolls. Each day will start with a morning seated meditation and pranayama (breathing exercises) session, followed by a long dynamic yoga practice. In the afternoon the group meets again for satsang (yoga philosophy lecture, discussion and Q&A), followed by another more gentle yoga practice, which will finish just in time to go and watch Ibiza s magnificent sunset. There is abundant time to visit the island's many beaches and sites, time to relax and sunbathe. N.B. Flights to and from Ibiza (IBZ) are not included in the price quoted above. For details on Quantum Yoga and other retreats or to contact Lara Baumann, click here.